My Best of the Year post takes time to complete. I go through all the meals of the past year and make a short list of the places that really impressed me with an unforgettable meal. It doesn’t have to be a fancy restaurant, it’s all about the food and the experience. Since 2011 was a year of travel for me, there were many restaurants to choose from. New places were discovered – Bangkok and Beijing, some revisited – Sydney and San Francisco, along with the usuals – Singapore, Las Vegas and Manila and of course I explored my island home – Bali – as well. 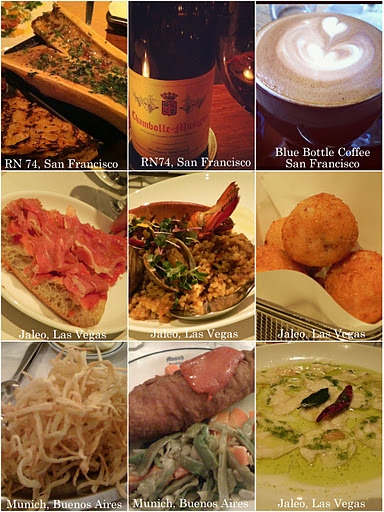 After much deliberation and elimination, and in no particular order, here are my best gourmet experiences of 2011. 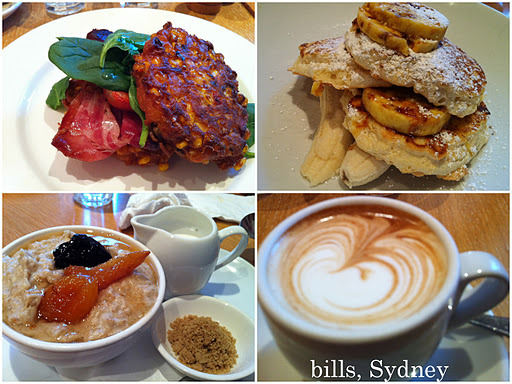 No questions about it, my best breakfast this year was at bills in Sydney’s Darlinghurst. From the fantastic flat whites to the amazing ricotta hot-cakes, the delicious sweet corn cake to the homemade oatmeal, the breakfast was amazing and the service friendly. How I wish there was a bills near me! 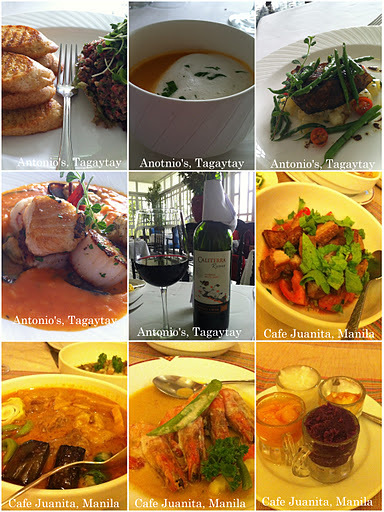 Since I’m from Manila, I had to include two restaurants that really impressed me back home: Antonio’s and Cafe Juanita. Antonio’s is a no-brainer and on most foodies best list. It made the drive up to Tagaytay worth it and their fine dining and Colonial atmosphere is just the right mix of fancy and simple. Cafe Juanita is a bit off the beaten track but also worth the drive to Pasig for home-cooked Filipino food. This is the kind of food I crave while living abroad. It felt like I was back at my lola’s (grandmother’s) house having one of those long leisurely Sunday lunches. Here in Bali, a restaurant that that’s a favorite for local food is Cafe Degan for classic Javanese cuisine in a classic wooden joglo (wooden house). Simple food and friendly service. They also have half their menu dedicated to Thai dishes as the chef used to work in Thailand. Whether you order from the Thai side of the menu or the Javanese side, you won’t be disappointed. In Singapore, where I was almost every six weeks, my cousin took me to Ippudo where we had a fantastic noodle lunch – flavorful broth, al dente ramen, chunky pork belly – everything was good. Two new places we visited this year were Bangkok and Beijing. 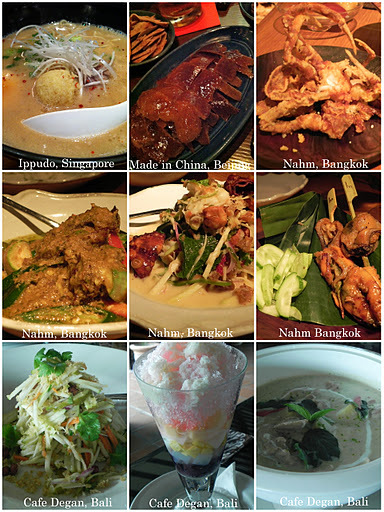 In Bangkok, I had my first taste of the real flavors of Thai cuisine. I tried many types of Thai food and enjoyed most of them but it was chef David Thompson’s fine dining take on classic Thai street food at Nahm that left me with a clear idea of how sophisticated Thai food is. In Beijing, we had the best Beijing duck (aka Peking duck) I’ve ever tasted at Made in China – extra crispy non-fatty skin with either sugar for dipping (a novelty!) or the traditional Hoisin-pancake-scallion-cucumber roll. And it wasn’t just the duck, the other dishes were also outstanding and it was the best Chinese meal I’d had all year. In the Americas, we start down South where we made our usual pilgrimage to Buenos Aires and where surprisingly, we didn’t eat at our favorite El Mirasol as often as we usually do. Instead, we rediscovered a Recoleta classic – Munich (or as the locals call it – “el munitch”) where we had dinner almost every night and never got tired of their repertoire of classic dishes – a perfectly grilled matambre (pork steak), crispy papas paille (shoestring fries), a simple green salad, the retro Chicken Maryland and Chicken Kiev plus lots of other home-style dishes from the past and the impeccable service from the white-jacketed old-timers just added to the atmosphere. Finally to North America, first at our usual stop in Las Vegas where we had a superb tapas meal at Jaleo where it felt like we were back in Spain. It was great to see the quality of Spanish food so lovingly recreated at chef Jose Andres’ hip and happening tapas restaurant. We also revisited our favorite city – San Francisco – so many lovely memories from past visits and so long since our last encounter in 2004. Dinner at RN74 was impressive – cool concept, fantastic Burgundy wines, packed with a mixed crowd and best of all, the food was really good – simple classic dishes made of incredible ingredients which is what San Francisco is all about. Last but not least, we go back to breakfast where I just have to mention the best coffee I’ve had all year (lots of close seconds – Sambalatte in Las Vegas, bills in Sydney and Liberica in Jakarta) but this one topped my list and made my mornings better – Blue Bottle Coffee. The coffee was prepared with so much love and they took their time getting it right which just goes to show that after all these years, San Francisco’s foodie ways haven’t changed, it’s only gotten better. And with that I look forward to another year of eating and traveling. I hope that 2012 will be as food-filled as 2011 was. Happy Gourmet Travels! I have enjoyed reading your reviews. Could you tell me if you have a favourite recommendation for a memorable breakfast in Bali as we have have a 40th birthday celebration and want somewhere with great food that maybe has a gorgeous scenery and food. We normally just eat at the W hotel where we stay but would like to try somewhere new that would fit a large group? Thanks for checking out my blog. As for breakfast with an amazing view and good food, you can’t go wrong with the breakfast at the Bulgari. It’s out of the way in the Bukit and pricey but has an amazing view of the waves crashing onto the cliffs of Uluwatu. The other place I would recommend is KuDeTa which always delivers good service, good food and a fantastic beach view with lots of people watching.